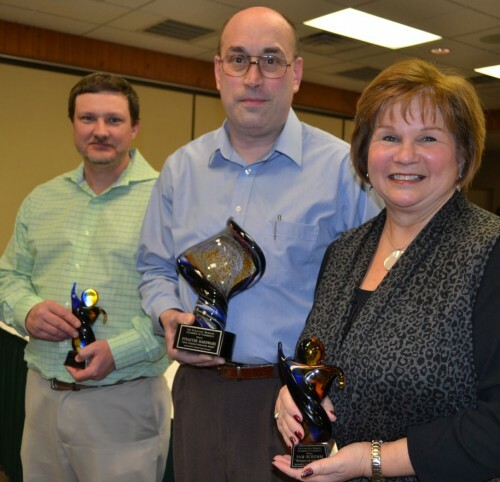 Eleven awards were given to local businesses and individuals during the 2016 Syracuse-Wawasee Chamber of Commerce awards banquet. Pictured are award winners and award sponsors. In front from left are Jeff Moerchen and Sara Kropf, M the Market, New Business of the Year; Emily Traycoff, Westmain Tavern, Restaurant of the Year; Christine Sands, Sands Accounting Inc., Service Excellence Award; Kelly Wedehase, Revolving Closet, Retailer of the Year; Heather Harwood, Wawasee Area Conservancy Foundation, Non-Profit/Service Organization of the Year; Chad Jonsson, Syracuse Parks and Recreation Department, Syracuse-Man of the Year; Chris Carboneau, Syracuse Hardware, Most Uniquely Syracuse Award; Pam Schumm, retired educator Wawasee Community Schools, Syracuse-Woman of the Year; Erick Leffler, Dynamic Spine and Rehabilitation Center, Young Professional Visionary Award; Chris Cotton, Ambassador of the Year; and Judy Wolfe, Wawasee High School resource teacher, Outstanding Educator. In back are Eric Erlenwein, Interra Credit Union, sponsor of New Business of the Year; Jason Traycoff, Westmain Tavern, Restaurant of the Year; Heath Simcoe, Mutual Bank, sponsor of Service Excellence Award; Jeri Yoder and Kim Strawbridge, Lake City Bank, sponsor of Retailer of the Year; Tom Tuttle II, Team Tuttle Mortgage LLC, sponsor of Non-Profit/Service Organization of the Year; Richard Owen, Owen Family Funeral Home, sponsor of Syracuse-Man of the Year; Scott Beasley, Northern Lakes Insurance, sponsor of Most Uniquely Syracuse Award; Tricia Small, Teghtmeyer Ace Hardware, Syracuse-Woman of the Year; Jessica Denton, Farmer’s State Bank, sponsor of Young Professional Visionary Award; Kristi Martin, Syracuse-Wawasee Chamber of Commerce; and Ron Baumgartner, The Papers Inc., sponsor of Restaurant of the Year. Chamber members submitted names of businesses and individuals within the community they felt perfectly met certain criteria for the 11 awards. Chamber Executive Director Tammy Cotton and Assistant Director Kristi Martin noted in some cases members were almost unanimous in their nominations. New Business of the Year — sponsored by Interra Credit Union — was one of those awards and went to M the Market. The business was honored for its efforts to revitalize the downtown area and for bringing many return customers from both near and far. Restaurant of the Year — sponsored by The Papers Inc. — went to a business that was also praised on bringing revitalization to the downtown area and for its level of quality: Westmain Tavern. For the Service Excellence Award, sponsored by Mutual Bank, Sands Accounting Inc. was recognized. Having been in the Syracuse area since 2008, the accounting firm, which also has an office in Ligonier, was honored for its exceptional growth and high standard of quality and service. Revolving Closet was honored as Retailer of the Year for its constant quality, revolving merchandise and draw with both locals and summer visitors. Lake City Bank sponsored its award. 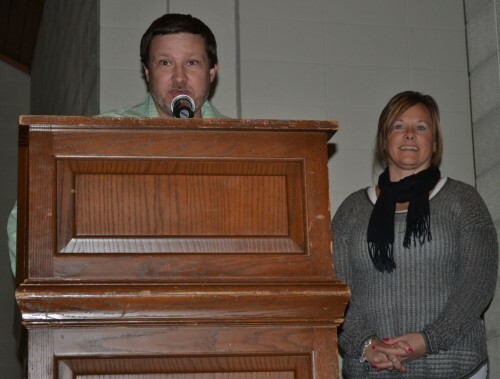 For Non-Profit/Service Organization of the Year, an award sponsored by Team Tuttle Mortgage LLC, members chose to honor the Wawasee Area Conservancy Foundation. The fund was praised for its exceptional service, many projects and work within the Syracuse-Wawasee community. The Young Professional Visionary Award — sponsored by Farmers State Bank — is only given to a young professional who is the founder or CEO of a company and has the determination to be successful. Winner Erick Leffler was praised for not only his success in business, but for his presence in the community. Judy Wolfe received the Outstanding Educator award. She has been with Wawasee Community Schools for about 30 years and is a resource teacher at Wawasee High School. In a written statement, a student reflected without her they might not have graduated. The award was sponsored by Lakeland Animal Clinic. For Syracuse-Woman of the Year, Pam Schumm was recognized. Schumm, who arrived in the area in 1974, was selected for her impact in the community as an educator, coach, advisor and sponsor. Her award was sponsored by Teghtmeyer Ace Hardware. Syracuse-Man of the Year went to an individual brought to the area in 2005 for a job. However, since arriving, Michigan native Chad Jonsson has brought fresh ideas and many projects to Syracuse. His award was sponsored by Owen Family Funeral Home. Most Uniquely Syracuse Award — to honor longtime businesses who capture the spirit of Syracuse — went to a family-owned business that has been in the community since 1969: Syracuse Hardware. The awarded was sponsored by Northern Lakes Insurance. 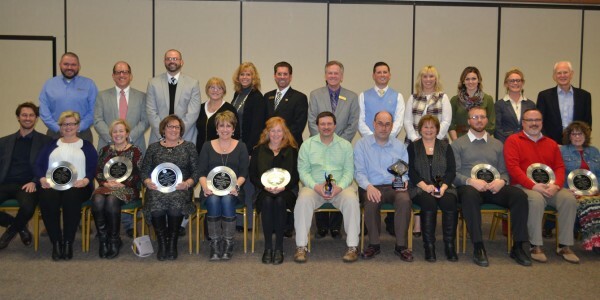 The final and newest award honors chamber ambassadors who go above and beyond in visiting chamber members, attending chamber events, mentoring and performing other actions beneficial to the chamber. Chris Cotton was announced as the winner of this award, sponsored by Parker Hannifin. Cotton thanked members and stated, “We (the chamber) continue to grow.” She encouraged members to participate in chamber events, including the networking Lunch N’ Learns. Beyond awards, the chamber also bid goodbye to outgoing president Jonsson; long-time board member Tricia Small will be the 2016 president. The rest of the chamber officers will be decided at the Feb. 3 chamber meeting. New chamber board members were announced as well and include Heath Simcoe, chamber ambassador and Mutual Bank representative; Judy Shoemaker, WACF and Westmain Tavern; and Jim Layne, Syracuse Police Department.